Hey Geethanjalites, how are you doing? Hope everyone is doing great. As you all know that the main motto of our institution is to "Strive towards the perfection" and we also strive each and every moment to get that to the fullest. So we are here with a very refreshing and a naive cause for each and every member of the Geethanjali family. We are very fortunate to have a young bunch of enthusiastic and astounding persons amongst us who have thought to lend a helping hand to the people who are in need of the care and help. 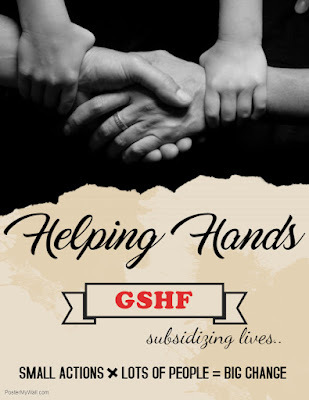 These young people have come up with a wonderful idea and have formed a club named 'GSHF' - Geethanjali Student Health Fund Club. Health is the primary and mandatory need for every individual and we all know that this has already been a business nowadays...so these young champs have intended to bridge the gap between the expenses and health care that every person is to be given and they have chosen the best way to eradicate this problem by forming the club. This is a club where the health issues of everyone at Geethanjali including staff faculty and students will be taken care of and handled to the max as possible. They are intended to help the needy people who fall short of medical expenses and help those people by collecting the funds from other members of the Geethanjali. The most wonderful part of the club is that everyone could contribute and they are also taking care of the donors who actually are big-hearted and supporting this cause. You will be given an SMS Update everytime you contribute stating that "We received the amount, Thank you - Team GSHF"
These guys are very inspirational to each and everyone in the college and also to the other people and we want all of you to support this cause as it is the basic need of every human being. Any of you facing any difficulty regarding any health issue and not able to afford the expenses visit them, explain to them the problem and claim your fund. We are very happy to introduce this club to you guys and have another great flower in our cap...hope you will also feel the same!